The animated 1941 classic Dumbo runs just over an hour and the 2019 live-action clunker Dumbo (*1/2 out of four) runs just under two hours. In other words, in the time it takes to watch the misbegotten new version once, a viewer could have watched the enchanting original twice (hardly a chore) or watched it once and then had time left over to get started on taxes, prick a painful blister, or undertake any other unpleasantry that, on balance, would still prove to be more enjoyable than sitting through this laborious new version. 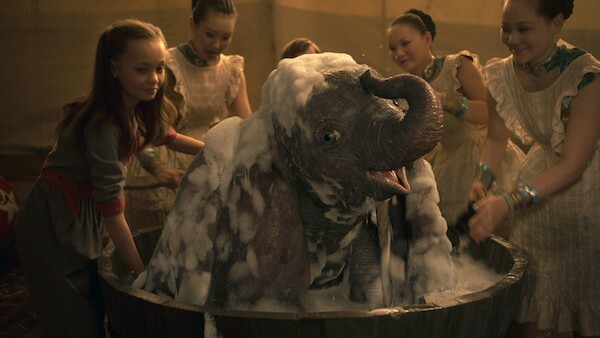 It’s a shame that the new Dumbo is such a lumbering bore, since Disney had mostly been on a roll with its live-action renderings of its animated gems. Beauty and the Beast, Cinderella, Maleficent and The Jungle Book were all better than they had any right to be — indeed, the only sore spots were those Alice in Wonderland adaptations, with Tim Burton directing the so-so first film and serving as producer on its excruciating follow-up (Alice Through the Looking Glass). Burton is back in the helmer’s chair for Dumbo, but this picture doesn’t even bring to mind those Alice endeavors as much as it recalls Disney’s Oz the Great and Powerful, another torturous undertaking that found a formerly exciting and innovative filmmaker (in that case, Sam Raimi) shucking aside all creativity simply to mangle and mutilate a cherished motion picture from yesteryear.